The Pittsburgh Penguins have signed forward Teddy Blueger to a two-year, entry-level contract, it was announced today by executive vice president and general manager Jim Rutherford. The two-way contract will begin with the 2016-17 season and run through the 2017-18 campaign. Blueger will join Wilkes-Barre/Scranton on Tuesday on an amateur tryout contract through the remainder of this season. Blueger, 21, completed his senior season at Minnesota State-Mankato, leading the Mavericks in points (35) and assists (24) while scoring 11 goals in 41 games as one of the team’s alternate captains. Seven of Blueger’s 11 tallies this year were game-winning markers. Those numbers earned him a spot on the WCHA First All-Star Team. The 6-foot, 185-pound Blueger improved his offensive statistics each year at Minnesota State, wrapping up his career with 108 points (31G-77A) in 155 games. He finished with 13 game-winning goals, 10 power-play goals and two shorthanded tallies. A native of Riga, Latvia, Blueger helped the Mavericks win back-to-back WCHA titles in 2014-15 and ’13-14. During the ’13-14 season, Blueger was named to the WCHA All-Tournament Team. Before jumping into the college ranks, Blueger played two years of prep hockey at Shattuck St. Mary’s in Minnesota from 2009-11. That’s the same prep school that produced Penguins captain Sidney Crosby. Blueger was selected by the Penguins in the second round (52nd overall) in the 2012 NHL Draft. 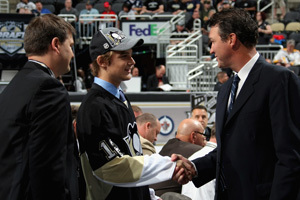 He was Pittsburgh’s third pick that year following the selections of Derrick Pouliot and Olli Maatta in the first round. After picking Blueger, the Penguins then took Oskar Sundqvist and Matt Murray in the third round. Blueger has suited up for Latvia for five major international tournaments, three times at the World Junior Championship (2014; ’13; ’12) and twice at the World Under-18 Championship (2012; ’11). Twice Blueger helped the Latvians medal at those tournaments, winning a silver medal at the 2014 WJC and a gold at the 2011 Under-18 WJC. Both of those tournaments, Latvia competed in the second division. At the 2011 World Under-18 Championship when the Latvians won gold, Blueger led the tournament in both goals (4) and faceoff percentage (68.8%). Blueger was named one of Latvia’s ‘Top-Three Players’ at the 2013 World Junior Championship and the 2012 World Under-18 Championship. Those were both years when the Latvians competed at the highest level of those tournaments.